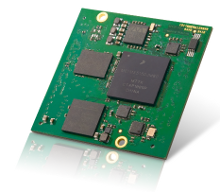 The APF51 is a reduced size processor board benefiting from a highly competitive price/performance ratio. Fitted with a 800 MHz i.MX51x processor, 64 MB to 512 MB LPDDR RAM, 256 MB to 32 GB SLC FLASH, a 10/100Mbits Ethernet port, 2 USB 2.0 high speed ports, and one USB OTG port, it is easily integrated into an embedded system thanks notably to its regulators and on board PHYs (Ethernet & USB). As usual at Armadeus systems, this board is equipped with a FPGA, here a Spartan 6A XC6SLX9, which increases considerably the hardware fonctionalities of the module. Note: no external debugger (BDI, JTAG) is required. A simple RS232 connection is enough for "low-cost" development. A Linux debugger is available (GDB). Cooling: None for temperature below 60°C*. * FPGA not taken into account. Depending on IP used, cooling can be required and max temperature can be decreased. Connectors: 2 x Hirose 140 pins fine pitch (0.5mm). Ref: FX8-140P-SV1(91).